Over the past few years, this blog has frequently made reference to ‘The Schools Collection’ (Bailiúchán na Scol) of the Irish Folklore Commission; a collection of primary school copybooks gathered under the direction of the Irish Folklore Commission between 1937-39. This is a most valuable, beautiful and fascinating resource, and nowadays a digitised copy of the original texts can be accessed online. The aim of the project was to catalogue, index, and conserve information on Irish traditions from across the country. This collecting scheme was initiated by the Irish Folklore Commission, under the direction of Séamus Ó Duilearga and Séan Ó Súilleabháin, and was heavily dependent on the co-operation of the Department of Education and the Irish National Teachers’ Organisation. Over the duration of the project, more than 50,000 sixth-class schoolchildren from 5,000 schools in the 26 counties of the Irish Free State were enlisted to collect folklore in their home districts. Topics covered under the scheme included those of supernatural lore, festivals, hidden treasures, diseases, cures and herbs, local crafts and customs, famous local people, information regarding holy wells, fairy forts, local fairs, games played by children, legends, riddles and proverbs and topographical information, to list but a few. The children recorded this material from their parents, grandparents, and neighbours. Material was written first into the children’s homework copybooks, and then re-written into the larger official notebooks that had been distributed for the scheme. The completed official notebooks were bound, paginated and numbered, according to parish, barony, county and province. Approximately 740,000 pages (288,000 pages in the pupils’ original exercise books; 451,000 pages in 1,128 bound volumes) of folklore and local tradition were compiled. Among the traditions and festivals recorded in this archive are those associated with Christmas time. A great variety of practises are recorded, some still familiar to us now, and some no longer common. The Yuletide practise of ‘mummering’ is less common and widespread now than in 1930’s Ireland, and there are hundreds of references to this Christmas tradition in the Schools Collection. ‘Mummering’ is a Christmas-time house (and public house)-visiting tradition involving local community groups who dress in disguise and visit homes within their community or neighbouring communities during the 12 days of Christmas. If the mummers were welcomed into a house (again, or pub), they often performed a variety of informal dances, musical recitations or told jokes. However, the hosts had to guess the mummers’ true identities before offering them food or drink. Judging by the number of references to the practice recorded in the Schools’ Collection, the tradition seems to have been especially popular in Co. Donegal and Co. Louth in the 1930s, though it was a nationwide custom. The tradition continues into the present day. If you would like to witness this spectacle, I suggest visiting the town of Dingle in Co. Kerry on December 26th where mummering is somewhat conflated with the largely similar traditions associated with Hunting the Wren. You will also be able to find the practise in other parts of Ireland on this day, and in far-flung places like Newfoundland where the long-banned tradition is now making a comeback. The priest was ignored and mummering went on. A few years later, however, his church, bolstered by the passing of a Dance Halls Act, got its hands on the running of all dances in Ireland’s rural parishes – and the might of the law was four-square behind the clergy in prosecuting those who engaged in the sinful and unIrish mumming, which didn’t contribute a penny piece to the coffers of the church either. According to Diarmuid O Muirithe writing in The Irish Times in 2000, The Wexford Mummers were arrested for dancing on the street in 1935. As late as 1947, the local paper reported, “Patrick Fanning of Raheen, Taghmon, was fined £1 for a breach of the Dance Halls Act. Of the seventy people found watching mummers in a loft, fifty three had paid two shillings to play cards for chickens. Sergeant McEvoy prosecuted. For the defence it was stated that Mr Fanning’s grandfather allowed mumming in the loft in days gone by. Although on the wane for some decades, perhaps it is time to resuscitate this once-widespread tradition? North-west Donegal is possibly about as remote as you can get on the island of Ireland, and the islands off the Donegal coast are as isolated a spot as you will find anywhere in the county. Many do not have permanent populations, and if you’re ever need to get away from it all, this is the place for you. Gola (in Irish Gabhla or Oileán Ghabhla) is a small island off the coast of Gweedore. The island measures 424 statute acres, with mildly hilly terrain. It is a haven for artists, birdwatchers, photographers and walkers, and the cliff s on the north side of the island attract many rock climbers. Near the island’s lake, bird life abounds; cormorants, razorbills and guillemots, as well as gannets and kittiwakes, can be admired. Although many Irish people may not realise it, they may be familiar with Gola Island through song: it is the birthplace of renowned Irish writer Seán ’ac Fhionnlaoich, and the island has also been immortalised in the traditional children’s song Báidín Fhéilimí (‘Féilimí’s Little Boat’). For centuries, a couple of hundred people eked out a living on Gola from fishing and subsistence farming. By the 1950s, however, the island could no longer compete with the economic opportunities off ered by the mainland. Gradually, Gola’s families stripped their houses, boarded their boats and sailed away to the mainland. 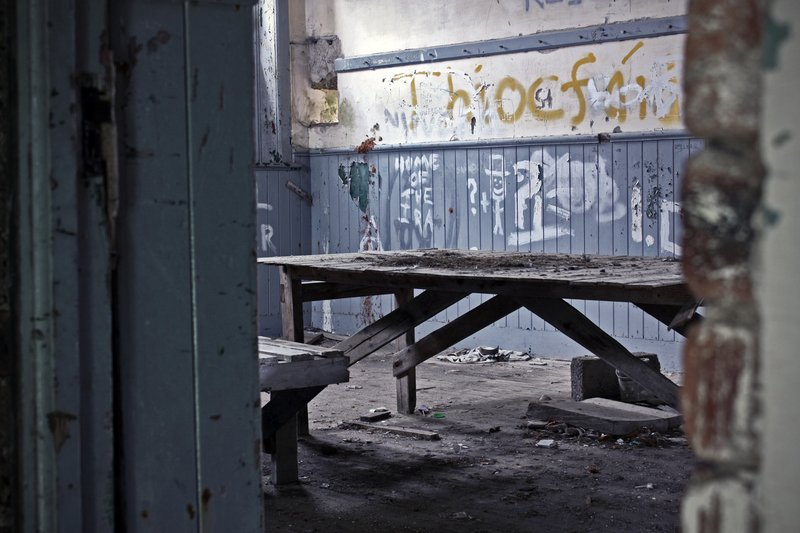 Th e closure of the island’s national school in 1966 marked the beginning of the end, according to Síle Uí Ghallchóir who was one of the last pupils at the school. Since the 1960s onward the trend on most of the off-shore islands has been a decreasing population. In fact, during the 1950s and 1960s, many of the smaller islands were forcefully evacuated by the Irish Government as continuous bad weather meant that islanders were unable to travel to the mainland for several consecutive months. The most recent census taken during 2016 showed 15 permanent residents on Gola, although the return of permanent settlement to the island is a recent phenomenon, with the island being largely unpopulated since the late 1960s. In 2005 the island was connected to mains electricity for the first time, and from being totally deserted over 30 years ago Gola now has electricity and water and the future looks far more positive. However, the population remains small and somewhat seasonal. Located on the shore, the old schoolhouse on Gola is in a most precarious position, with coastal erosion threatening to erase the structure from the landscape. Stormy weather in recent years means the sea now comes right up to the door at high tide. It is weather-beaten, the roof has collapsed and in all likelihood it will be completely washed away in the coming years. 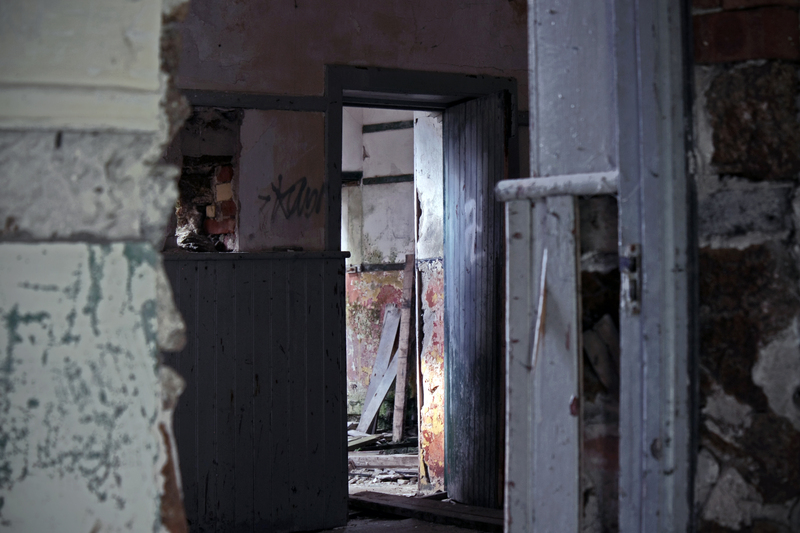 (Such was the fate of the old schoolhouse on Scattery Island off the coast of County Clare). The village of Bunbeg is a relative stones-throw from Gweedore and Bloody Foreland in West Donegal. 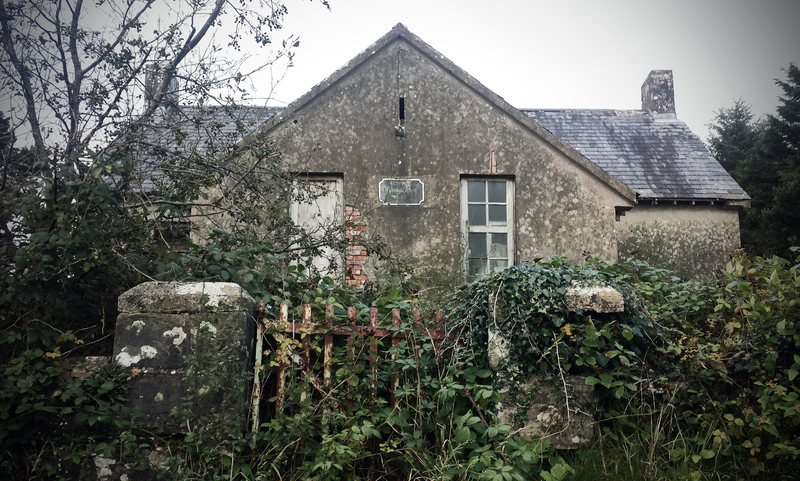 Just outside the little village in the townland of Knockastolar, and perched above the road from Bunbeg to Dungloe at a Y-junction, is a schoolhouse lying empty, and painted in the green and yellow of Donegal. Its date plaque was missing, although its form suggests it is a late nineteenth-century schoolhouse with a later extension perhaps. The original section of the building is identical to the old schoolhouse on Whiddy Island off Bantry Bay in County Cork (dated 1887), with an entrance porch to the side. The picturesque town of Moville lies on the western banks of Lough Foyle in County Donegal where the Bredagh River flows into the sea. The locality was the adopted home of the dramatist Brian Friel, and it still attracts many visitors who make the long journey north to the Inishowen Peninsula and Ireland’s most northerly point on nearby Malin Head. The new trade brought wealth and development to the town, and a growth in population. Naturally, the growing population would need education, and there were a number of national schools constructed, not just in the town, but in the hinterland also. The schoolhouse featured here is one such building. Scoil Bhride Culaidh is located near Cooly Cross, a rural spot just 3km north-west of Moville. The building itself dates to 1931, but examining the First Edition 6-inch and 25-inch Ordnance survey maps, you can see that this school house replaced an earlier school named ‘Tiyrone School’ just a few hundred metres to the east. This earlier school house, which dates to at least the 1840s, was unusually located away from the roadside, enclosed in the corner of a field. Two ‘right-of-ways’ led to the school through the surrounding farmland. Perhaps someone out there has an explanation for this school’s inconvenient setting? Was it perhaps built on land donated by a local landowner? Today, an area of rough ground marks the location of the original school building. Located in the south of Co. Donegal, and on the northern shore of Donegal Bay, the village of Inver is sometimes referred to as the hidden jewel of the northwest. In recent years, the ‘Wild Atlantic Way’ coastal driving route has brought an increase in tourism to the area, with the parish being situated on the bay of Inver. Nonetheless it remains a quiet spot; rural in character with hilly and rough grazing land that is occasionally lashed by Atlantic winds and rain. Although now quiet, the area was once home to an important whaling post during the 18th and 19th century, and a large whaling station and fleet was based in the Port of Inver, 2 km from the modern Inver Village. Thomas and Andrew Nesbitt set up the whaling business in Donegal Bay in 1759. Thomas was the inventor of the gun-harpoon, which was witnessed by Arthur Young during his tour of Ireland 1776-1779, as he states: “From many experiments he brought the operation to such perfection that, for some years he never missed a whale, nor failed of holding her by the harpoon”.The ruins of the old whaling station still remain in the port but have eroded and deteriorated to rubble. During the 19th century the area was busy enough to require a railway, and Inver railway station opened on 18 August 1893. However the final train passed through the station on 1 January 1960. It has been closed since.